1 X SMART OUTFIT: THIS SHOULD BE A SUIT, CORPORATE AND BUSINESS-LIKE, A GOOD FIT, TIDY AND SHARP LOOKING. 2 PIECE OR 3 PIECE ARE BOTH FINE. PREFERRED COLOURS ARE DARK BLUE, GREY AND CHARCOAL. a black suit is also acceptable if you have no other options. THE SHIRT SHOULD BE LIGHT IN COLOUR (SUCH AS WHITE, PALE BLUE OR LIGHT PASTEL). PLEASE WEAR AN APPROPRIATE SMART TIE (NO NOVELTY/COMEDY TIES PLEASE) AND SMART CLEAN SHOES THAT ARE AN APPROPRIATE MATCH FOR THE SUIT. 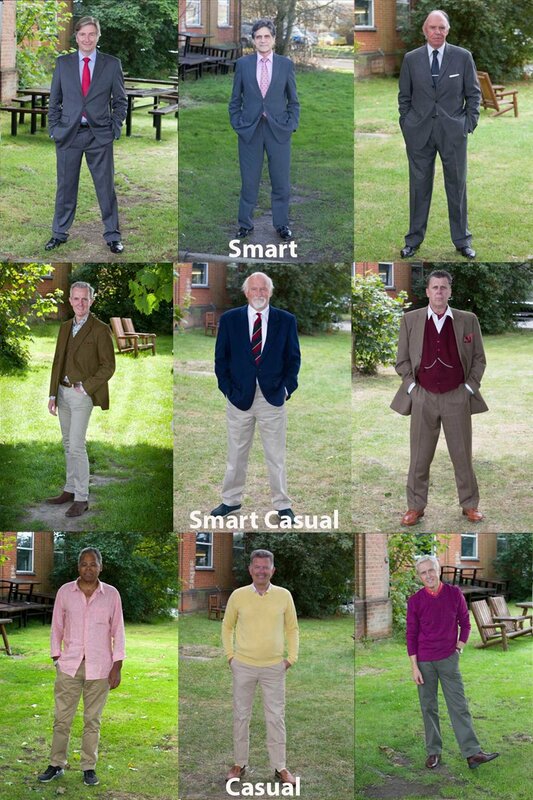 1 X SMART CASUAL OUTFIT: THIS COULD BE TROUSERS/SLACKS/CHINOS/CORDUROYS WITH A SHIRT, POLO SHIRT, JUMPER, CARDIGAN OR BLAZER ALONG WITH SHOES OR BOOTS AS APPROPRIATE. A BIT OF COLOUR IN THIS OUTFIT IS PREFERRED. 1 X CASUAL OUTFIT: DAY TO DAY CASUAL CLOTHES. BE YOURSELF, BUT INCLUDE SOME COLOUR IF YOU CAN AND AVOID too much BLACK AND WHITE IF POSSIBLE. WE SUGGEST TROUSERS/SLACKS/CHINOS/CORDUROYS/SMART DARK JEANS WITH A SHIRT, POLO SHIRT, JUMPER, CARDIGAN, OUTDOOR JACKET/COAT/LEATHER JACKET ETC.